As you put Christmas into the memory box and look toward the New Year, how will you be Christ to those around you? In what ways will you use your gifts, strengths and talents to bless your family members, your friends, members in your church and co-workers? How will you support the spreading of the Good News of Jesus' mercy and grace with those who don't yet know His love? What will you do in 2010 to fulfill the powerful purpose God has for your life? These are all important questions to ask, answer and then manifest! You can make a difference for the cause of Christ! Share His love, His grace and His Word with those in your circles of influence. 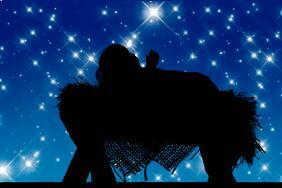 Epiphany starts January 6th and commemorates the wise men taking the message of Chrsit into the world. In many churches that have Epiphany services, a wonderful symbolic experience is shared. Small white candles are distributed to each person in the service. The church lights are dimmed, with only the Christmas candle shining it's light in the darkness. The minister takes his or her candle and ignites it from the Christmas candle flame. The pastor then lights the candle to the first person in the front row. That person ignites the candle of the next person . . . and so on until all the candles are glowing. Everyone then leaves the church singing with the "goal" to get your candle home while still lit. This symbolic act commemorates the light of Christ going into the world. As His followers, we can think about how we do our part in the Great Commission to share the Good News of Jesus with everyone. It's All About Jesus! is a newly revised eBook written especially for men and women who want Christ to be the center of this Holiday (Holy Days) Season! Learn how you can enter into a time of joyful preparation, meaningful gift-giving, inspiring activities and leave all the stress, anxiety and consumerism behind! As followers of Jesus we are in this world but not of it. Experience a Christ-centered season that will strengthen your faith, honor our Lord and minister to those you love as you celebrate the life-changing birth of the Son of God. Available for immediate download. 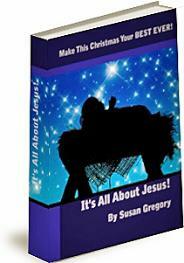 Just $8.95 for the eBook and Workbook.